Gaming is expanding like never before, with the worldwide video game marketplace forecast to increase to $111 billion by 2015. The demand for software developers is forecasted to increase 22 percent by 2022. LIU Post’s Digital Game Design and Development students will master highly versatile and in-demand skills across all areas of game development, from programming and coding to design and story telling. Game Industry Expert Faculty: Led by Independent Games Festival and IndieCade Festival award-winning game developer and educator Ramiro Corbetta, who co-developed Sportsfriends for Playstation and PC/Mac/Linux. State-of-the-Art Digital Games Lab: Taught in a new, high-tech digital games lab featuring computers, projectors, TV screens, modern game consoles, and a variety of the latest software. B.F.A. + M.A. Option: Accelerated five-year dual degree program. Instructional Approach: Collaborative environment modeled after real-world game studios that teaches the art of teamwork while students master game development expertise. Experiential Learning: Access to internships in nearby New York City at renowned game studios such as Rockstar Games, Avalanche Studios, Arkadium, Dots, and Gameloft. And access to the on-campus LIU Post Student Innovation Incubator, a physical and virtual workspace for students to launch startup businesses and collaborate with successful entrepreneurs. Our lab has 25 Macs with 24" screens. They can run OSX or Windows operating systems and have all the software needed to play and develop games. We have two large projectors and a flat screen which allow us to play 3 different games on big screens at the same time. The sound system is powerful enough to bother everyone else on the floor. At the spring 2015 Game Show, students in the M.A. in Digital Game Design and Development program showed off the interactive products of their work during the 2014-2015 academic year. Peers, friends, and faculty tested the games while designers talked about the development process and vision for their virtual worlds. 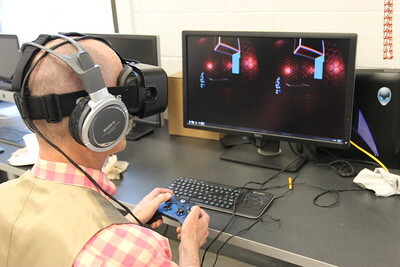 First year graduate student Scott Tongue’s game, Vistics, utilizes the Oculus Rift virtual reality display headset that allows the player to explore the inner workings of the Vistics computer system by moving around the environment in a 2.5D virtual reality platformer. Scott said the coding and design process to complete Vistics to its current level—a 60 minute demo version of what will be expanded into a 3-5 hour full game for his M.A. thesis project—took about five months and a lot of trial and error. With virtual reality games, he said, “you have to try different things to figure out what makes people motion sick and find a balance between what’s enjoyable and what’s frustrating for the player.” Scott has exhibited the game at NYC VR, NYC Arcade 2015, Cornell Tech Disruptive Tech Day, Indiecade East 2015, and Playcraft NYC Spring Expo 2015. Vistics is currently in the running for a showcase spot at the Entertainment Software Association E3 College Competition, a national game development competition that highlights top talent from colleges and universities. Siming Miao, a second year who came to LIU Post from China in order to learn programming and 3D modeling, modeled the world of his survival horror game, Deep Coma, after Humanities Hall. “The final goal is to escape the building,” he said. View photos from the 2015 Game Show.